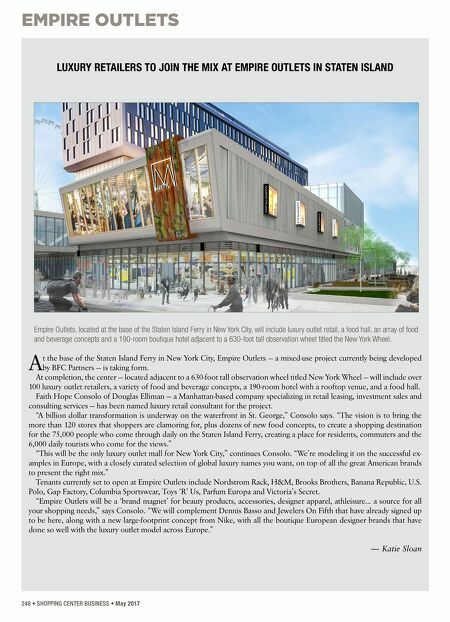 EMPIRE OUTLETS 248 • SHOPPING CENTER BUSINESS • May 2017 LUXURY RETAILERS TO JOIN THE MIX AT EMPIRE OUTLETS IN STATEN ISLAND A t the base of the Staten Island Ferry in New York City, Empire Outlets — a mixed-use project currently being developed by BFC Partners — is taking form. At completion, the center — located adjacent to a 630-foot tall observation wheel titled New York Wheel — will include over 100 luxury outlet retailers, a variety of food and beverage concepts, a 190-room hotel with a rooftop venue, and a food hall. Faith Hope Consolo of Douglas Elliman — a Manhattan-based company specializing in retail leasing, investment sales and consulting services — has been named luxury retail consultant for the project. "A billion dollar transformation is underway on the waterfront in St. George," Consolo says. "The vision is to bring the more than 120 stores that shoppers are clamoring for, plus dozens of new food concepts, to create a shopping destination for the 75,000 people who come through daily on the Staten Island Ferry, creating a place for residents, commuters and the 6,000 daily tourists who come for the views." "This will be the only luxury outlet mall for New York City," continues Consolo. "We're modeling it on the successful ex- amples in Europe, with a closely curated selection of global luxury names you want, on top of all the great American brands to present the right mix." Tenants currently set to open at Empire Outlets include Nordstrom Rack, H&M, Brooks Brothers, Banana Republic, U.S. Polo, Gap Factory, Columbia Sportswear, Toys 'R' Us, Parfum Europa and Victoria's Secret. "Empire Outlets will be a 'brand magnet' for beauty products, accessories, designer apparel, athleisure... a source for all your shopping needs," says Consolo. "We will complement Dennis Basso and Jewelers On Fifth that have already signed up to be here, along with a new large-footprint concept from Nike, with all the boutique European designer brands that have done so well with the luxury outlet model across Europe." 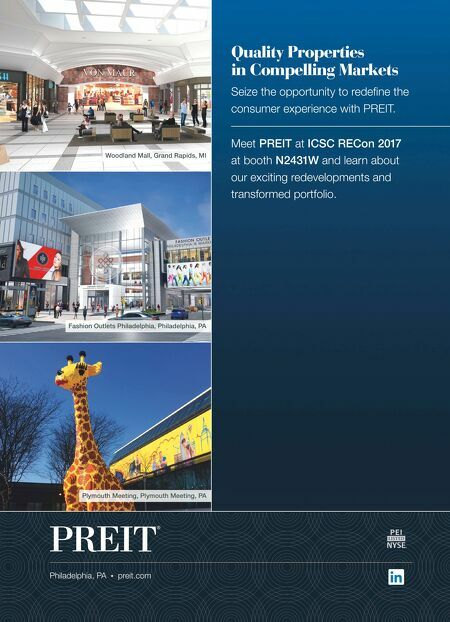 — Katie Sloan Empire Outlets, located at the base of the Staten Island Ferry in New York City, will include luxury outlet retail, a food hall, an array of food and beverage concepts and a 190-room boutique hotel adjacent to a 630-foot tall observation wheel titled the New York Wheel.